Dr. Niemiller joined the faculty of the Department of Biological Sciences at The University of Alabama in Huntsville (UAH) in August of last year. As an assistant professor of ecology, the speleologist divides his time between the classroom and the field. "My research ranges broadly from evolution, speciation, and biogeography to spatial ecology and conservation. The work I'm doing here often deals with species that are rare, threatened, endangered, or relatively unknown," he says. "It's hard to detect these subterranean species directly due to the size limitations imposed by caves. We can use cameras, but it still gives us a limited view." Dr. Niemiller is also using molecular genetic approaches to better distinguish between groups of cave species, such as cave-dwelling millipedes. "We want to get a better understanding of the 15 or so species in this species complex. What are their species boundaries? Are there cryptic species?" he says, referring to those that are similar in appearance but genetically distinct. Cave beetles are another example. "They're a crazy diverse group with 150 species," he says. "Are they truly restricted where one species is unique to a cave or did past experts oversplit them?" Assisting Dr. Niemiller in this effort is a team of three graduate students. The first, doctoral candidate Joseph Benito, is focused on the genetic differences between cave- and surface-dwelling species. "Morphologically," he explains, "cave species often lack eyes and have longer antennae. But what genes account for this?" 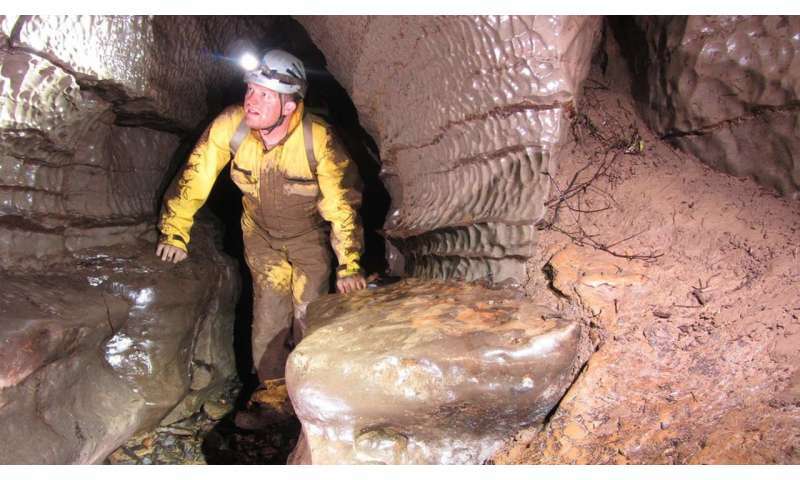 At the same time, master's students Carson Woodward and Spencer Boyd are developing eDNA assays to detect cave fishes and evaluating the likelihood that water is capable of carrying microbiological contaminants into cave systems. Of particular interest is the fungus responsible for white-nose syndrome, which has resulted in the recent declines in bat populations nationwide. "The ever-increasing risk of biodiversity loss from a plethora of threats, such as urbanization, groundwater pollution, and climate change," he says, "adds urgency to our need to understand the ecological and evolutionary responses and resiliency of subterranean biodiversity." As for Dr. Niemiller's own habitat, he's relieved that his career has led him to the ideal one here in Huntsville. "Climatewise," he laughs, "this is so much better than central Illinois!"